KELBA (Australia) has introduced the Kelba Diamond series 5kg and 10kg portable bench scales with stainless steel bodies rated IP65. The weighing/sensing method is via a single point load cell, with a display update of 15 times a second. With one RS232 as standard, clear 1-inch, 5-digit LCD display which can be decimal point programmed, the small footprint of the scale takes up very little room and both units offer dual range displays from 0.5 grams to 2 grams depending on the model chosen. There are two power sources - ac mains power and battery power, with approximately 20 hours life on battery power alone. The Kelba Diamond scales offer a full stainless steel platter 230mm x 180mm, with the actual scale dimensions 270mm long x 220mm wide x 80mm high. 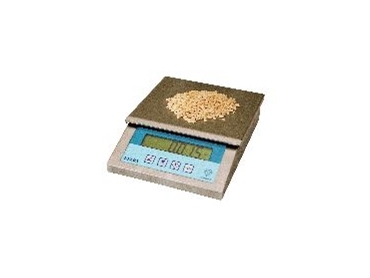 The scales are supplied with an ac power pack that also recharges the lead acid rechargeable battery.